After years of making little black media streaming boxes, Roku is adding something bigger to its product portfolio: The company has teamed up with TCL and Hisense to make actual Roku TV sets. Both companies preview their own co-branded Roku TV sets at CES in Las Vegas this week, and Roku says that the devices will be in stores in the U.S. and Canada this fall. “It’s a television that we have designed from the ground up,” said Roku CEO Anthony Wood during a recent interview. Wood told me that Roku TV will be available via six different models, with both companies producing a variety of screen sizes ranging from 32 inches to 55 inches. There is no word on pricing yet, but given the choice of OEMs, it seems clear that Roku TVs will sell for less than the newest smart TVs from companies like Samsung. “As a brand, we are value-focused,” Wood told me. 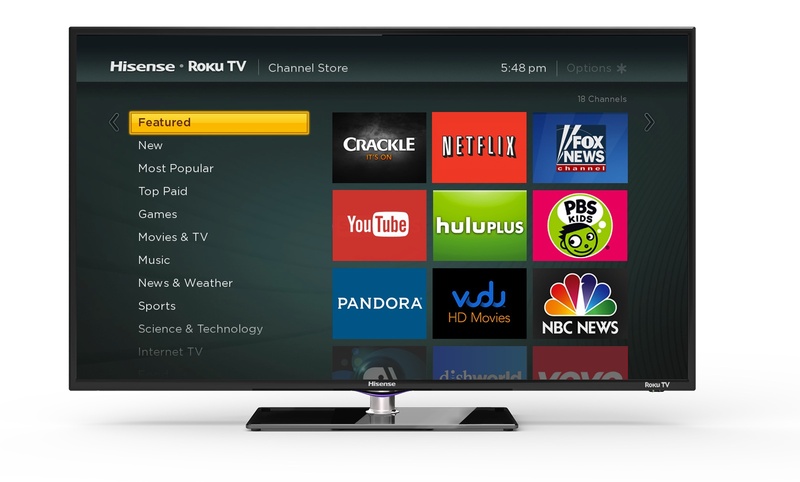 Roku on your TV, without the box: The Roku TV offers access to the familiar channel store. So what are Roku TVs going to offer consumers? For one, the ability to access live TV as well as devices connected to other TV inputs, like your game console, from the Roku home screen. The remote is also simplified, with Wood telling me that it will feature “half the buttons than usual remotes.” And of course, there’s always access to the Roku channel store, which is basically the same as on any Roku box. However, there won’t be any actual integration with live TV: Roku TVs don’t come with their own programming guide, and Wood told me that there are “no immediate plans” to allow app developers to overlay their apps over live TV. Roku is also using the consumer electronics show to highlight some business metrics: Wood told me that Roku owners streamed some 1.7 billion hours of media last year, which represents a 70 percent growth over 2012. Also, Roku is now “just shy of 8 million Roku players sold in America”, according to a carefully worded press release. Early last year, Roku announced 5 million total sales.